The Ensign Drafting Art Table by Alvin is an example of practicality, convenience, and functional design rolled into one. 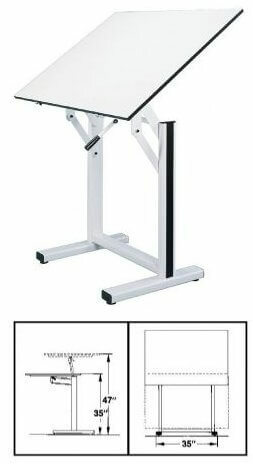 The tabletop height and angle are spring-action controlled. This semiautomatic design provides simultaneous height and tilt adjustments employing an extendable single action lever, conveniently located just beneath top on the right hand side. Height Range: 37" to 47"